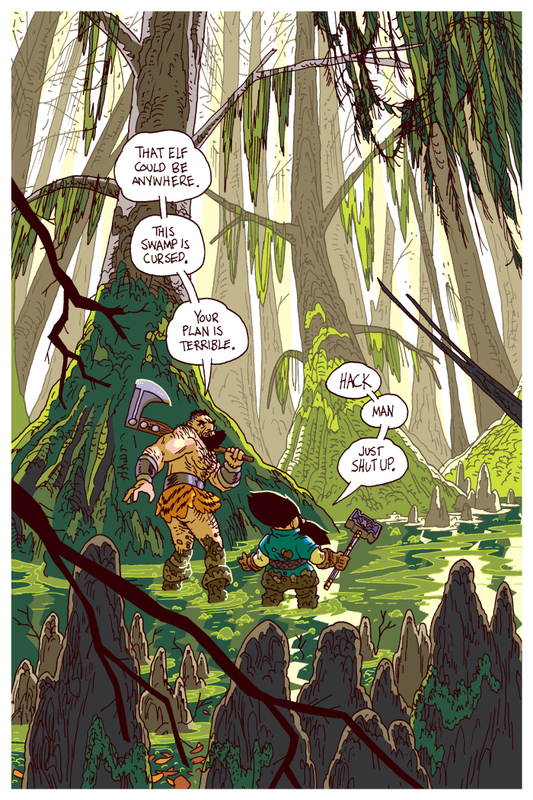 …and thus, each adventurer unwittingly becomes the other’s voice of conscience. And the solid buddy comedy dialog continues! I did NOT originally think I was going to like Hack on the team this much but they’ve got that CHEMISTRY, man! Thank you! It’s become my favorite dialog to write. Thank you! It’s been a real surprise for me too! I’m glad so many readers are enjoying it! Yeah! It turns out there are cypress trees like that in central Ohio as well! I was looking at Louisiana, but quickly discovered locations closer to me that have trees like this! I can’t be done already! I need more!! I love his sassy under-bum peeking out! What a pin-up shop! Sorry, I am a little lost. How much time has passed since they left the mountain? Did they go for beers and this is after, are they headed for beers, or are they trying to track the elf, beers forgotten for now? Thanks, man. Sorry that I didn’t catch the clues. It’s fine. I could have been clearer about it. I have a fast pace I’m going for, so sometimes things get lost.